In geological disposal of high level radioactive waste, it is essential to start considering consolidation accompanying cementation, taking into consideration high earth pressure and solution of groundwater. 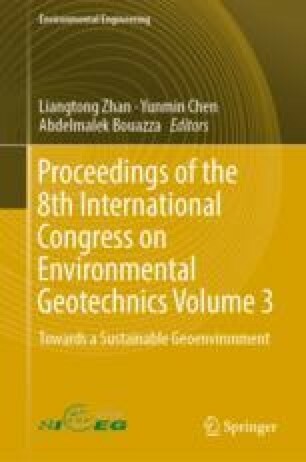 For engineering application of natural analogue, the authors thought consolidated buffer material will have similar physical properties to bentonite ore. In this study, we aimed to quantitatively evaluate the influence of cementation on swelling properties. In order to achieve this aim, we focused on swelling pressure and swelling strain of bentonite, using two kinds of bentonite ore whose generation dates are different respectively. As a result, swelling pressure was decreased by approximately one order of magnitude due to the influence of cementation. In addition, the swelling strain of younger bentonite ore did not decline, but those of older bentonite ore declined about half of original whether consolidation was retained or not. Therefore, there is a possibility that the swelling deformation of buffer will decline as cementation gets stronger over the course of time. This research was conducted with support from ‘Waseda University Grants for Special Research Project (Grant B, 2017)’. Also, we got the bentonite ore samples by the support from Dr. M. Ito (Kunimine Industries) and Kunimain Co., Ltd.